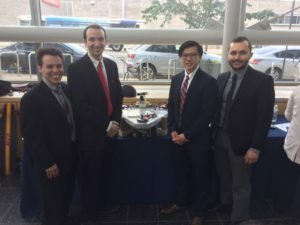 The Swerve team with their advisors at Drexel’s Edmund D. Bossone Research Center: L-R: Dr. Tein-Min Tan (Co-Advisor); Alexander Nhan (ECE); Harrison Katz (MEM)’ Freddy Watcher (MEM); and Dr. Ajmal Yousuff (Head Advisor). 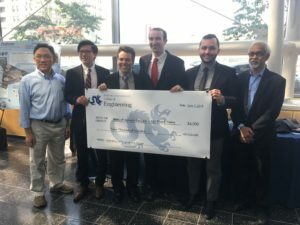 A SICK LiDAR sensor was used to build a winning robotic platform in the prestigious Drexel University’s annual College of Engineering senior project design competition. For Freddy Watcher, a Mechanical Engineering and Mechanics (MEM) major, and his three teammates who comprised the winning team – Alexander Nhan (Electrical and Computer Engineering, ECE); Harrison Katz (MEM) and Matt Wiese (MEM) – the process was invaluable for learning how to create something innovative that works. Watcher, joined by two other MEM students and one Electrical and Computer Engineering (ECE) student, set about to design and build a robotic platform. There was a lot of trial and error, testing and collaboration among the Swerve team during the project which was taken as a class over three 10-week quarters of the 2017/2018 school year. Among eight teams who competed, the first-place result was the Swerve Robotic Platform, a highly versatile, three-wheeled, autonomy-enabled vehicle that is capable of carrying large loads while moving at high speeds and accelerations. Swerve was designed, fabricated and tested using motion-capture systems, advanced machining, computer simulations and software as well as sensors. “Robotic mobility platforms today contain just a couple of the elements of lightweight, high speed, omni-directional and integrated autonomy but Swerve incorporates all four,” Watcher says. Such elements make Swerve innovative, surpassing the functionality of similar platforms including one designed by NASA. For starters, Swerve weighs less and carries more than similar robots. Vehicle weight had to come in at under 100 lbs. and support heavy weights, including loads up to 300 lbs. Swerve weighs about 60 pounds. The vehicle had to go faster than Olympic runner Usain Bolt at more than 28 mph, and accelerate faster than 19 feet per second. Swerve can go as fast as 20 mph in speed- limited tests, but without the limitation can exceed 28 mph with ease. Integrated autonomy was key: Swerve needed to have human-machine interface capabilities and function in both structured and unstructured environments. This meant the ability to be human-controlled while still having the option to move freely on its own (autonomously) as needed, responding to a set of previously input datasets to get around. Sensors were a key technological element of Swerve’s design to support navigation, autonomy and nimbleness. The Swerve uses 2D Light Detection and Ranging (LiDAR) sensors for area-monitoring data capture and IMU (Inertial Measurement Unit) sensors. To be specific, the Swerve robot receives the 2D LiDAR data through a SICK TiM561 sensor, which provides scan angles and ranges to the nearest object at those angles. These scans can then be visualized and used to create 2D representations of the robot’s local environment. 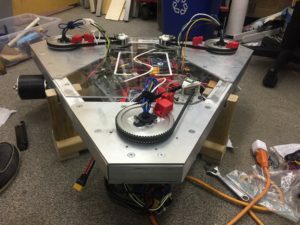 Wachter credits SICK’s enthusiasm for the project from a connection that came about from his attendance at a robotics conference, ROSCon 2017, in Vancouver. There, he connected with a SICK west coast account executive who connected him to George Thiel, SICK account executive for the northeast region. A number of mechanical and structural elements make Swerve nimble, fast and omni-directional. “Swerve has caster wheels that can rotate in every direction and uses slip rings to keep all the wires tangle-free,” Wachter says. This means wheels can move independently and turn on a dime. Brushless DC motors allow the Swerve to accelerate quickly. Many of the mechanical design elements of the Swerve impressed the CoE senior design project judges. “The major part of what helped us win the competition was an in-depth design which were described well in our report,” Wachter says, noting elements such as welded crush tubes built into its aluminum chassis gave Swerve the strength to withstand heavy loads. Fabrication of Swerve’s components included 5-Axis water jet cutting, 3D CNC milling, aluminum welding, as well as manual lathe and milling processes performed by the Drexel Machine Shop along with a local maker-space in Philadelphia called NextFab. The Drexel CoE design competition culminated in June 2018 when competing teams were given only six minutes each to present their entries. The Swerve team had a strong idea going into the project, based on a request and sponsorship from a former co-worker of one of the students: Josh Geating, project stakeholder and robotic tinkerer. Geating contributed design input and will potentially use Swerve to compete in BattleBots competitions in California. Geating underscored how the team designed the platform with the human-machine interface in mind. “Project Swerve is an attempt to make the most agile robotics wheeled platform to date while maintaining a high level of precision and sensing to enable autonomy and highly dynamic motion. Power, precision and mass are often mutually exclusive in robotics, and the combination of these three in the Swerve platform enables many unique applications,” Geating said. While Swerve may live on in BattleBot applications for now, future uses abound. In addition, personal mobility uses for Swerve include serving the disabled. Entertainment and amusement industry applications include serving as a base for trackless rides, allowing for easily changing the consumer experience without building a whole new attraction. Think Halloween rides. The logistics industry already has companies like Amazon deploying robots in the warehouse for picking orders. Swerve could supplement a warehouse labor force to meet peak demand periods or work every day. “Swerve has potential to work alongside warehouse personnel in a dynamic environment,” Wachter says. Indeed, the Swerve platform holds the potential to incorporate machine learning (ML) and artificial intelligence (AI). “The framework we used would allow opportunity for ML and AI to be used though it would take a significant amount of time to develop customer-specific applications, but it can be done,” Wachter concludes.